Is There A 'Better Way' To Handle Campus Sexual Assault? 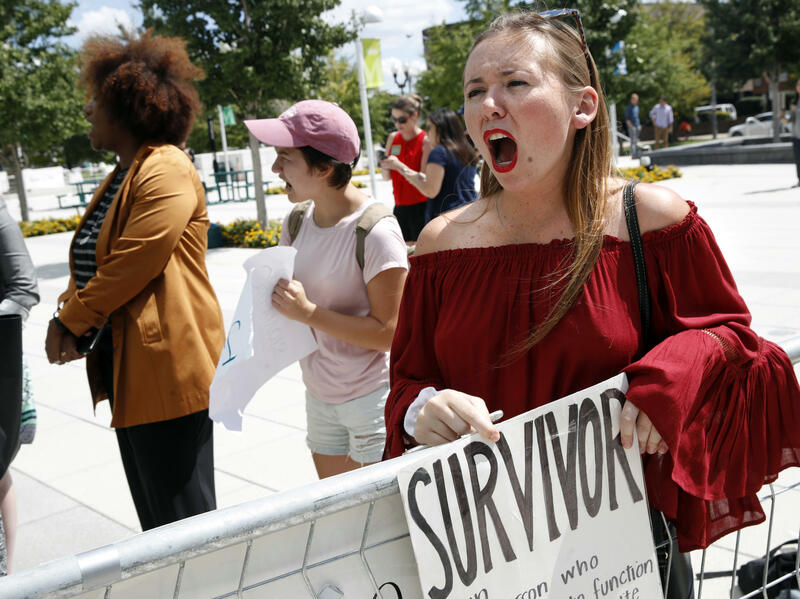 Meghan Downey, 22, a recent graduate from the College of William & Mary, protests outside an Arlington, Va., auditorium after Education Secretary Betsy DeVos spoke about campus sexual assault. During a recent policy address, Secretary of Education Betsy DeVos insisted repeatedly that there's a "better way" for colleges handle campus sexual assault. Secretary of Education Betsy DeVos insisted about 10 times during her recent policy address that there's a "better way" for colleges handle campus sexual assault. Now, as officials begin work to find it, they may well be taking a cue a few groups that DeVos says has already "made progress on these difficult issues." Here's a look at the recommendation of those groups. DeVos cited a task force of the American Bar Association, and another by the American College of Trial Lawyers, both of which managed to find consensus on how to make the current system more fair to accused students. The ABA's Criminal Justice Section Task Force on College Due Process Rights and Victim Protections issued its recommendations last spring, hashed out by a diverse group of advocates and lawyers holed up together in a conference room for eight hours at a time. "Walking in, I was very wary," says one participant, Laura Dunn, who founded the victim advocacy group "SurvJustice" in 2014, about decade after she says she was raped at college. "There was apprehension on all sides that it would be challenging and hard and frustrating and possibly resulting in zero agreement at all," she recalls. But over lots of coffee, emotion, and pressure to listen more and bend further, Dunn and the others got to a set of rules they could all live with. "Nobody gets everything they want," says another participant, Cynthia Garrett, co-president of the group Families Advocating for Campus Equality, which represents the interests of accused students. "I understood I had to compromise just like everyone other person in the room did." One biggie for everyone was how much evidence should be required to prove a sexual assault. Like many others, Garrett saw the current "preponderance of the evidence" standard as too flimsy, and she wanted to raise it to require "clear and convincing" evidence. But for Dunn, that was a deal-breaker. Ultimately, their compromise began to take shape, as participants started agreeing to a bunch of other protections. For example, the task force decided that students should have attorneys who can actually speak during hearings. Students should also see all the evidence being considered, the task force said, and both sides should be able to do some cross-examination through written questions. The task force recommended against the so-called "single investigator model," in which the investigator is also the person rendering judgement. And members said cases should be judged by a panel that would have to be unanimous, rather than by any single person. "That was kind of a 'give' to assure people who were concerned about rights of accused," says Dunn. "We were ensuring that campuses [would be] really sure when they made this decision." After all that was hashed out, the issue of evidence got easier. As long as all those other protections are in place, members agreed, a lower standard is OK. Otherwise, they concluded, the evidence bar should be higher. Garrett says consensus also became easier after the group decided to ditch all the baggage that comes with the legal labels like "preponderance of the evidence" or "clear and convincing." Instead, they just spelled out exactly what they had in mind. "We wrote out that the decision makers must be convinced," says Garrett. "They have to actually believe the evidence. There's no more guessing. That's how I reached the point at which I said OK."
Both Garrett and Dunn say they've taken some flack for compromising from their own respective sides, which only underscores how hard it may be for DeVos to get any kind of broad buy-in from all the warring factions: those incensed by what they see as government overreach and a virtual witch hunt, and those outraged by an administration they see as hostile to victims. Indeed, even before DeVos started laying out her position on the issue, many were already expressing outrage. "We do not trust this administration," longtime activist Lisalyn Jacobs said during a protest rally outside DeVos' recent speech. "The administration is headed by someone who talked about grabbing women by a word that I will not use," she said. Some want DeVos to convene a diverse committee to help hash out new rules, as the ABA task force and The American College of Trial Lawyers did. But there is even disagreement in what those groups concluded; the ACTL recommended that the standard of evidence should be raised. ACTL President Bart Dalton says a new framework is needed to stop the accused from being "railroaded" and improve a process that leaves everyone "shortchanged." But, he says, the ACTL and ABA recommendations are more similar than they might appear. If the ACTL had delved into as much detail as the ABA on other issues like the right to cross examination, "we might be willing to go to a lower standard," Dalton says. "These things push and pull on each other. The more other protections you have, the more reasonable it is to go to a preponderance standard. The fewer protections you offer, the more you need to have a clear and convincing standard." He agrees, the current political climate will make consensus difficult. People may see the ACTL recommendation to raise the evidentiary standard as "anti-victim," but "that's complete nonsense," says Dalton, who has been representing victims of sexual abuse for decades. "You don't do any justice for a victim if whatever happens is a result of a system that is not viewed as fair." He insists a broader consensus is possible as long as cooler heads prevail. "It can absolutely be done," Dalton says. "There's always an emotional element to this but we came to consensus fairly quickly." In her address, DeVos also pointed to one other "promising" idea that would simply get campuses out of the business of adjudicating cases of sexual assault, and outsource the job to experts. The idea is to set up regional centers where professionally trained specialists would investigate and adjudicate allegations. It's been promoted by two former prosecutors, who've spent decades going after sexual assault, as well as legal experts and some schools. They say the regional centers would be better equipped to ensure fairness and inspire confidence, and, as DeVos put it, allow "educators to focus on what they do best: educate." And let's zoom in on another member of President Trump's cabinet. 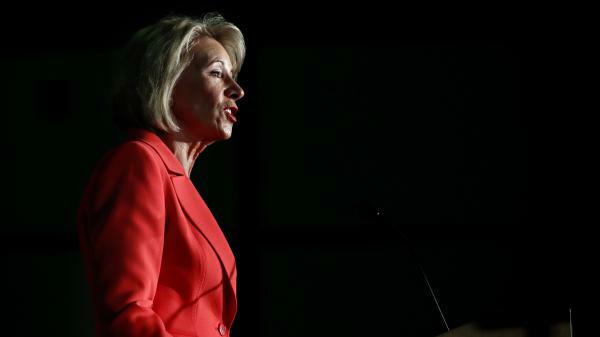 Education Secretary Betsy DeVos has said this repeatedly, there is a, quote, "better way for schools to handle cases of campus sexual assault." Now Education officials say they are trying to find it. DeVos says new rules must be more fair to the accused students. And she mentioned a few compromised proposals recently hammered out. 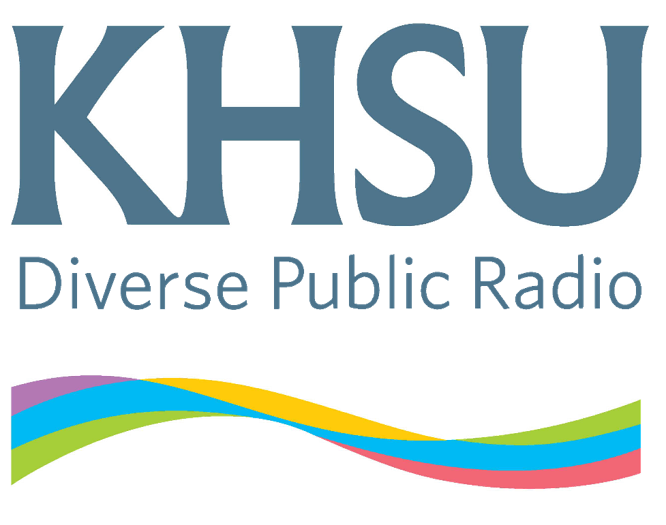 As NPR's Tovia Smith reports, those may be a model for changes to come. TOVIA SMITH, BYLINE: Secretary DeVos says public comment will be key to shaping any new rules, and she wants to incorporate, quote, "the insights of all parties." One model she cited as promising was a task force convened by the American Bar Association. Their aim was to look at the issue from all sides and come up with recommendations. LAURA DUNN: I think walking in, I was wary. SMITH: Laura Dunn founded the group SurvJustice to advocate for victims years after she says she was raped at college. She was one of a dozen participants from all camps on the ABA task force who spent several eight-hour sessions holed up together in a conference room. DUNN: There is apprehension on all sides that it would be challenging and hard and frustrating and possibly resulting in zero agreement at all. SMITH: But over lots of coffee, emotion and pressure to listen more and bend further, Dunn got to a set of rules she could live with, as did those on the opposite end of the issue like Cynthia Garrett from the group FACE that advocates for accused students. CYNTHIA GARRETT: Nobody ever gets everything they want. And I understood that I had to compromise just like every other person in that room did. SMITH: One biggie was how much evidence should be required to prove a sexual assault. Like many others, Garrett saw the current preponderance of the evidence standard as too flimsy and wanted to raise it to, quote, "clear and convincing." But for Dunn, that was a deal breaker. Ultimately, their compromise began to take shape as participants started agreeing to a bunch of other protections. For example, students should have attorneys who can actually speak during hearings. They should see all the evidence being considered and should be able to do some cross examination through written questions. The group also agreed that cases should not be decided by investigators or by any single person but rather by a unanimous panel, as Dunn ultimately concurred. DUNN: That was kind of a give to assure people who are more concerned about the rights of those accused that we were ensuring that campuses were really sure when they made this decision. SMITH: At that point, the evidence issue got easier. With all those other protections in place, members agreed a lower standard is OK. Without them, the bar should go up. Garrett says it also helped that they ditched all the baggage that comes with the legal labels like preponderance or clear and convincing and just spelled out exactly what they meant. GARRETT: We wrote out that the decision-makers must be convinced. They have to actually believe the evidence. There's no more guessing. That's how I reached the point at which I said, OK.
SMITH: Both Garrett and Dunn say they've taken some flak for compromising from their own sides, which underscores how hard it may be for Secretary DeVos to get any kind of broad buy-in from all the warring factions. UNIDENTIFIED PEOPLE: (Chanting) Shame on you, not on us. Shame on you, not on us. SMITH: And even before DeVos started laying out her position on the issue, many, like longtime activist Lisalyn Jacobs, were expressing outrage. LISALYN JACOBS: The administration is headed by someone who talked about grabbing women by a word that I will not use, right? We do not trust this administration. We don't trust Betsy DeVos. SMITH: Some want DeVos to convene a committee to help hash out new rules like the ABA task force or another group DeVos cited, the American College of Trial Lawyers. That group came to a different conclusion that the standard of evidence should be raised. But President Bart Dalton says members remain open-minded. And he says a broader consensus is possible as long as cooler heads prevail. BART DALTON: It absolutely can be done. There's always an emotional element to this, but we came to a consensus fairly quickly. SMITH: It's easier to do, he says, when you start with something everyone should agree on, that a system that's mistrusted by some ends up hurting all. Tovia Smith, NPR News. Transcript provided by NPR, Copyright NPR.